Last May, we hosted a game community social cooking challenge called Society of Chefs. The first recipe we tackled was Portuguese Custard Tarts, a tricky but rewarding pastry. The first event was a big success and this Sunday, April 9th, we’re hosting another one! This month’s challenge is to make a Korean dish from Maangchi. 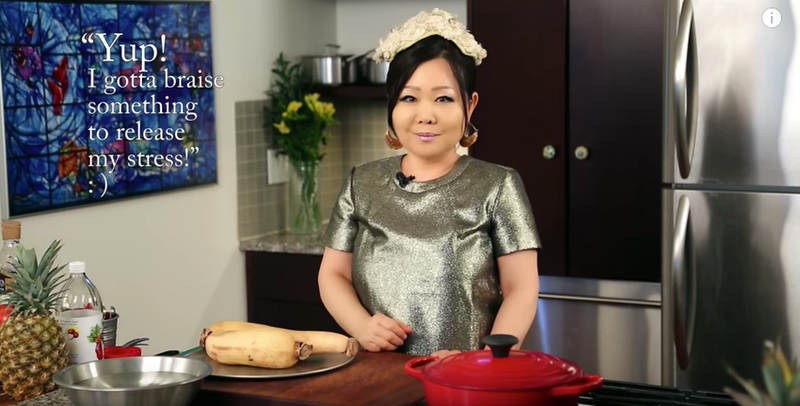 Maangchi’s YouTube cooking channel boasts over a million subscribers and her clear, easy-to-follow videos have expanded the reach of Korean cuisine around the world. Society of Chefs has no winners or losers! The goal is to have fun, try something new, and to feel connected to people in the gaming community around the world. We may not be able to cook in the same room together, but we can share in the experience of creating and enjoying food. Watch videos in advance, purchase ingredients the day before, and let us know you’re participating! On twitter or Google+, use the hashtag #societyofchefs to start talking about your recipe. On Sunday, let us know when you’ve started to cook! Post photos of the process, ask questions, vent frustrations, and share your finished photos online. You don’t have to be a professional food photographer! Have fun, enjoy the challenge, and join us while we venture outside of our cooking comfort zones.